Alright folks I was unsure of where to put this since it includes MAJOR spoilers for episode 5x11 "The Boy Must Live". So I just created a new thread. Before getting to it let me just explain how I got this info. I got this info from a trusted person who has access to the reviewers advance copies of the episodes. This person has watched the episode. I will not reveal anymore about the source than that. So either take it, or leave it. Also I'd like to categorize these so that you can pick and choose whether or not you want to peak under the spoiler tags. I will post them in order of least spoilerific, to most spoilerific. These constitute plot points, and twists, and other major reveals. BE WARNED THAT SOME OF THESE WILL SPOIL YOUR WATCHING EXPERIENCE IT IS UP TO YOU WHETHER OR NOT TO OPEN THE SPOILER TAGS. Next level of spoilerific, this deals with the nature of "The Plan"
Michael is the crux of the plan. All the components that Walter has been collecting are intended to be assembled into a time machine. The machine is intended to be used to bring Michael to the future (sometime between 2036 and 2609 I assume from what is told to me by the source). In this future that they will bring Michael to, scientist will study Michael, and will come to realize that they need not sacrifice emotional capacity for greater intelligence. (which is what the cortical implants do.) By altering the future in this way Implant Observers never come to be, and thus the invasion will be erased, because through Michael, future humans will discover how to achieve both the super-intelligence of Observers and great empathetic ability exhibited by Progeny XB-6783746 (Michael). September is alive in some capacity, and will meet up with the Fringe team. (whether or not he is Donald as an old man, or a time-traveling September, or a re-Observerized September was not made clear to me by the source) The source says that September will give Walter a "White Tulip" to encourage him to carry on with the plan. (this suggests that Amber Walter was indeed given blue timeline memories by Michael with the touch last episode) The source also says that September and michael share a moment revolving around a music box, and that September and the Fringe team reflect on those they have lost. The Redverse will be featured in 5x12 in case you didn't already know. Like I said, some major revelations, and some not so major, but it looks like 5x11 will be a heck of an episode to watch, and it looks like the finale is shaping up to be pretty cool if this is any indication. Also If you would like add the 5x12 and 5x13 tadbits to the finale thread, go for it! I still think about Walter in LSD falling to his death at Redan Lake...I think perhaps he will sacrifice himself. Last edited by DarthLocke on Thu Jan 03, 2013 10:00 pm, edited 2 times in total. DarthLocke wrote: This works find too! I put the 5x12 little tidbit, that is really only a confirmation of something you already probably know in the bottom spoiler box. Thanks for the spoilers. Good stuff. DarkUFO wrote: Thanks for the spoilers. Good stuff. This goes along with what I've always said and thought. That there is no past future, just roads not taken, and or Possible futures. This goes with what September said to Walter in the Firefly episode that (paraphrasing here) There are many possible futures all happening simultaneously, and that he doesn't know which one will ultimately come to pass. You see the reason the Badservers can exist in this scenario is because their present is so far into the possible future (2609) that probabilities have yet to have collapsed into a concrete present that prevents them from existing. They are at the moment still possible. But it seems that if the plan works, then a set of probabilities will become concrete enough to collapse into a future that the implant Observers never ever exist. So this will retro-actively change the timeline once again since the Badservers had already invaded the past (2015) in relation to the current (2036) events. This would in theory allow Etta to never be lost in 2015, and for her to have grown up with Peter and Olivia as she should have, and the invasion had never happened, thus resulting in her alive and well in 2036. There are always past futures if there multiple time lines that are unfolding at different times at the same times. It's a hard thing to make one understand because we think of "future" as a date ahead of where we are, but that is not necessarily true, as if a time line was created from a branch of by a person/people time traveling back and altering it from a certain point within it onward, then the time period in the former time line the time traveler time travels FROM, immediately becomes hi/hers past, and the past date now altered by the time traveler, becomes THE TIME TRAVELER's FUTURE and (with no other time travel pending) so do all the dates that have to exist in the new part/branch off of the time line. The many-worlds interpretation is an interpretation of quantum mechanics that asserts the objective reality of the universal wavefunction and denies the actuality of wavefunction collapse. Many-worlds implies that all possible alternative histories and futures are real, each representing an actual "world" (or "universe"). It is also referred to as MWI, the relative state formulation, the Everett interpretation, the theory of the universal wavefunction, many-universes interpretation, or just many-worlds. In many-worlds, the subjective appearance of wavefunction collapse is explained by the mechanism of quantum decoherence, which resolves all of the correlation paradoxes of quantum theory, such as the EPR paradox and Schrödinger's cat, since every possible outcome of every event defines or exists in its own "history" or "world". In lay terms, there is a very large—perhaps infinite—number of universes, and everything that could possibly have happened in our past, but did not, has occurred in the past of some other universe or universes. In Lost many people don't realize that in "Because You Left" John travels to '2007', but the thing is that 2007 in this time line doesn't exist yet (to them "a" future), so he traveled to a past iterations 2007 that ends up repeating itself (whatever happened, happened) in "their" time line...When we get to "Follow the Leader" it becomes clearer that this sudo-time fold has occurred because John is alive (flashing through), dead (in the coffin), and being manipulated/projected by the smoke monster all at the same time and in the same space! This time fold only works if there are past-futures to fill in gaps and come very closely and/or exactly repeat in certain instances to make up the differences for it's over all continous equations of variables. Because he can't time travel back once he is dead. It's all about when anything exists in relation to when any other thing exists. Now perhaps what the machine did is eliminate Peter from being able to be in any other time lines that did/do exist and the Observers have locked out all other iterations of the timelines from this amber one, however the RED universe also still exists and should constitute as it's own universe and it's own timeline, which is why there are still other futures already as the red also continues onward. -But in order for the Observers to have some kind of hold, it requires a limitation to the humans of this time line, such as technological advancement. Don't get me wrong, I totally understand this time-travel theory as it applies to our real life universe (if of course there is such thing as time-travel other than theoretically in our real universe). I also understand it as it applies to LOST. But the thing is; Fringe does not use the same time-travel rules as LOST did, nor does it use our "real life" time-travel theories. It merely borrows from a few different time-travel theories. In the context of what has been shown and spoken of In the narrative of the show. 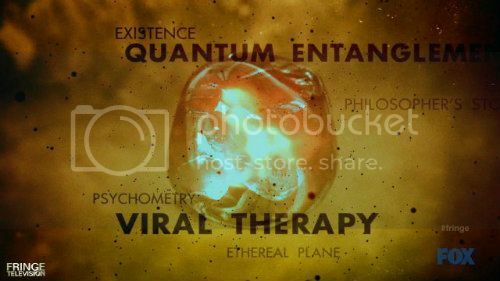 In actuality Fringe has made up its theories on time in its own show universe(s). LOST was simply What happened, happened. So if you traveled to the past of a given timeline and did anything other that just exist and observe, then you were always present in the past of that timeline, and anything you did contributed to the past of that timeline, forming part of that timeline's history. Like all the Sawyer Dharma stuff and Jack being the actual cause of the incident rather than stopping it like he was trying to do. Locke (2004),while jumping around, merely saw a bit of the past and it was (pre-crash)Ethan catching him time-jumping that caused Ben to want to find him. He then got to visit the future (2007) of that timeline that he would actually be dead for (since he died in 2004-5 [Locke in the box season 3, and 4 ending]) after he turned the wheel and left. This future (same timeline 2007) is when Richard takes him the compass and says to give it to him the next time John sees him (in 1954?) because Richard (1954) would not recognize him otherwise. He then took Richard (1954) the compass in the past and caused earlier Richard (1954) to see him as special, and caused him to go visit him as a child. Smoke Locke (with real Locke's memories) used (2007) Richard as a pawn to get real Locke (2004) (whom he knew was time-flashing to the future) to take (1954) Richard, his future (2007) self's compass setting up the trap that would allow Smokey to eventually inhabit Locke's body. Had Smoke Locke not done that, then there may not have been a smoke Locke. Anyway that is how it worked in LOST It was a single timeline that had people bouncing around on it, the only person in LOST who got to rewrite timelines was Desmond because he was "Special" This is one of my many faults with the show since it was really never full explained, why he was special but I digress. Back to Fringe. It the actual narrative of Fringe there are Two universes. Prime and Alternate. There are two sets of timelines Prime-Blue/Alternate-Red, and Prime-Amber/Alternate-Amber. Walter, in the aptly titled Episode "The Road Not Taken", Explained to Olivia that every choice we don't make creates an alternate reality wherein we did make that choice or another and so on... (My paraphrase) He is explaining to Olivia why she might have glimpsed one of these Roads not taken. This was NOT the red universe as is commonly misunderstood to be. Clues being the FBI existing, Blonde Olivia being mistaken for what should have been a red headed Olivia, Scarlie with hair No Lincoln, Broyles in a suit etc. Nor was it some other obscure never to be seen again universe. It was actually a possible future AKA alternate reality/Road not Taken/Road never to be taken. September as I mentioned said that there are many possible futures all running simultaneously but that he did not know which ***ONE*** would come to pass. The badservers are able to exist because they originate from one of these many possible roads to take, very far down that road, and they have the ability to time-travel. It effectively makes their reality into a road not taken. Here is how best to look at it, at least for me. Walter crossed over, and kidnapped Peter, and as he brought him back here they almost drowned but September saved them both, allowing Red Peter to live in the Prime universe. This created the opportunity for Prime Olivia to meet red Peter as a child, and unknowingly cross over to the red universe and tell Walternate that Peter was in the Prime universe. This led to the war between the universes, which led to Peter going into the machine and choosing the prime universe. This led to the 2026 corrupted future we saw and eventually led to Walter and Peter sending the machine parts through the wormhole closing the loop. This could have went on and on and on for some umpteen number of times until Peter finally decided to choose balance. This history was re-written/over-written/erased and replaced however you want to call it. On this one there was a change made by a time-traveler (September) coupled with a change made by a player (Peter bridging the two parallel universes together) These were the engines used to eliminate one timeline for a new one. September decided not to save Peter in this rewrite, and by not saving Peter, he prevented Olivia from ever meeting him as a child and in doing so also prevented her from going over there and telling Walternate about his son, he was able to effectively accept the death of his son, and he and his Elizabeth were much closer for it. Amber Walternate was much more well adjusted than Red Walternate was. When Walternate turned on his machine it entangled to the prime's machine, and allowed the balance Peter had already chosen to bridge the universes together. It was at this moment when Walternate realized what happened to his son. then yadda yadda until the invasion and now 2036. One timeline for each of the two universes at a time. Many possible futures for each of the two universes. That is how it is. Going on what the narrative has shown us. The narrative has not shown us infinite futures, and infinite pasts that are still going on. Last edited by rtterry3225 on Sat Jan 05, 2013 12:03 am, edited 1 time in total. On this one there was a change made by a time-traveler (September) coupled with a change made by a player (Peter bridging the two parallel universes together) These were the engines used to eliminate one timeline for a new one. September decided not to save Peter in this rewrite, and by not saving Peter, he prevented Olivia from ever meeting him as a child and in doing so also prevented her from going over there and telling Walternate about his son, he was able to effectively except the death of his son, and he and his Elizabeth were much closer for it. Amber Walternate was much more well adjusted than Red Walternate was. When Walternate turned on his machine it entangled to the prime's machine, and allowed the balance Peter had already chosen to bridge the universes together. It was at this moment when Walternate realized what happened to his son. then yadda yadda until the invasion and now 2036. In The Road Not Taken Olivia travels/slips into the role of another blue Olivia where the Lewis/Pratt case is different than the one she is experiencing/or is frome. It's unclear that if this iteration is "along side" or a previous one, but in order for her to experience it either has to, or had to exist. IMO it is a previous one, just like "The Day We Died", because it ends up showing is something "progressive" as [this] Olivia can save one of the twins this time, where both where already dead in the other parallel blue universe. Cassimir Effect they way they are presented works because there are futures (really a better word is histories) that both have yet to exist, co-exist, and have already existed simulatamously. So Eliose can run the maze and info to run the maze because she recieved conscience information of an Eliose who has ALREADY run the maze. Our Olivia know about the child Observer because her conscience was brought forward and she wiped out, killed, or exchanged places with the new Olivia, but technecally Peter and Olivia are from another timeline...one that ALREADY existed. Joel Wyman said is possible that their time line is still "out there", but rather for all intended purposes this was going to be Peter's (and by extension) Olivia's new "home"
This may be FRINGE for Dummies-type question, but as we dive deeper into Peter trying to return to his timeline, does the old timeline co-exist with the new one in different locations like a quasi-universe? Is it actually a location he can go to? JP: Well, certainly, Peter is under the belief and his drive has been — he is under the belief that his timeline exists and he’s trying to get back to it. Now, the idea of the timeline, it’s not the same as a [new] universe, but it’s sort of synonymous. JW: In this version of history, he does not exist. Are there are other versions? You’ll have to wait to find out. So it’s not like technically Olivia and Walter are at the machine, somewhere, in another timeline, wondering where Peter went? JP: It’s certainly possible. That’s what Peter believes. JW: It’s possible. You’ll have to wait and see. It will become clear. It will become clear in upcoming episodes or more towards the end of the season? JW: I think in upcoming episodes, you’ll start to see the real picture of what happened and how he has to get home. In Abrams Star Trek (something that is referenced in Fringe- The Road Not Taken) The time line were Spock prime and Nero come from still exists and is moving onward, they just created a branch off. Time travel doesn't always = death of a universe or a reality, just a change to create another. (reciprocity) And it all relies on methods, dynamics/condintions, and semantics to determine truth. Season 4 Brave New World implies Loop in progress so we have a history within itself that we can not see the way it was before it was altered by September. And technically every single aspect of life is it's own reality since a branch off would, will, has occurred at any given point, and thus every time is it's own reality. It's "which history" will come to pass at "which point" in "which timeline", Rick. The red universe(s) existences alone provide alternate history (past present and future) that co-exists to ours. Their future exists too. There is not just one future, or one history. The word future is relative. In fact I am going to guess that although what ever time line the characters end in/with shows a happy "time period"...I'm willing to bet there will be something that proves that it's only over for "here and now in relation to them", but not for others elsewhere. -Because "it" (life- the will of the universe) is about the experience and learning from it. And the show, like Lost, wanted to tell a story about these people and what it took them to get to a certain destination...a better place. If I'm understanding you, the D(1) is a past future and E(2) is the current future. OK I agree. What I'm saying is that it makes no difference in Fringe because for our characters, D(1) is dead and gone. it has been replaced by E(2). If the plan works it'll be replaced again by a theoretical F(3), or actually will revert back to another D but(3) since there will never be any pastward time-travel/invasion. The Physical plane of the timeline and the physical people living on that plane are ALWAYS the same. History just re-writes itself around them. So technically it isn't timeline (1) Timeline (2) it is more like history (1) and history (2). History (2) does not overlap or co-exist with History(1) it replaces it altogether. The difference in LOST was that History (2) /as it relates to my example here\ was always what happened. There were two Jacks in 1974 One on the island having just arrived from the future, and one as a child getting beat up for his best friend. Same goes for Sawyer, One on the island having come from the future and acting as LeFlour, while the Other was witnessing his father kill his mother and commit suicide. And so on with all the other time-displaced characters. For whatever reason, for the sake of our story, yes, it seems our characters can not go back there (s1-3 timeline or before). But in the bigger reality (truth of the matter), because of what I said in that first paragraph, and because in a multiple universe dynamic, there would be spots in various histories that would be identical, and depending on which piece of history existed first, would then some piece of history be past, present, future in comparison to other pieces in any given time line, could all realities still exist, despite not being able to "get to them". Lets say I exist in a linear fashion until 2015 then I time travel back in "my" time lines 1970's. If there are no course correctors or technology interfering, then I have potentional to create an new time (because now it may be altered with my presence, knowledge, ect from 1970 on. Pre- Season 1-3 blue Timeline(s) - 2009 (Road Not Taken) and "a" pre-existing 2026 (The Day We Died/Peter and the Machine)...Red universe died prior to 2026...blue universe in process of dying in 2026. 1. We know in the amber time line the Observers seem to primarily reside in 2609. -But we do not know if this is where they have always derived...is this the 2609 of their original time line of their origin? -Because according to Peter and the Machine for many time lines do both the red and blue universe die due to a Peter choosing one side over the other...and it's hard to say if "when" is the same in all time lines, but it seems implausable that they would make it to 2609. So, then how do the Observers keep existing if both universes kept dying??? 3. Our characters seem not to be able to go back to any previous iteration, but we do not know if the Observers can or can't? In "A short story about love" September was locked out of the time line...so what does that mean? -What in this case constitutes a time line? Where or when was he if he couldn't be "there" and if the other time lines (except for this other amber-red) are gone? That's why I am wondering if they found a way to preserve a section of their original history like 2015-2609 and made it into their own time line, but it still doesn't explain how Peter and Olivia end up here, unless September networked them back into the equation some how and that even the amberverse might have existed before and acts as a time line that can be more heavily re-written upon?? Again this is where Septembers quote to Walter in The Firefly about the nature of possible futures is quite literally in play here. Also In September's mind, he told Peter that he was human, but from many years into a possible future. We now know that this was sometime between now and 2609. Right? So at some unknown time between these dates There was an Origin for the Observers. Lets say for the sake of this explanation that it was in 2400. Out of the great big number of possible future that are still possible at the moment one of those futures in the year 2400 had a moment that was the origin for the Observers. Between this Origin moment in 2400 until the Moment in this same possible future's timeline that a decision to invade their timeline's 2015 past was made (in 2609), the Observers developed Time-Travel. Correct? Ok because the still possible future (2609) has access to time-travel, and they decided to use it to travel to the past to Observe the origins of their timeline (big bang moment onward), and then subsequently invade the past (2015), then their existence here is hinging on the notion that their possible future continues to exist in relation to the present of this timeline (current 2036). That means at the moment it is still a possible future. So in order to eliminate the invaders, we need to take steps to prevent that possible future from even being able to exist. How do we do that? We build a time machine, and we take Michael (who is a super intelligent post modern human that still has emotions and has abilities like his evil counterparts, but without the evil implants) to 2400, (wherein the origin of his evil counterparts sprang into existence), and explain to the 2400 scientists that if they go through with their plans they will, in effect, be ruining not only the future, but also their past, and that it could effect their existence. Then we would convince them to instead study this amazing child, and adjust their planned genetic experiments to replicate only his type, and to forego the implant tech. This will extinguish the evil observers, because it will destroy their genesis/origins. This in effect will make the possible future they existed from, not be possible anymore. Also effectively erasing the invasion of 2015, thus allowing Etta to grow up with her parents, and for this 2036 to be re-written. This is what the spoilers are suggesting. 1. We know in the amber time line the Observers seem to primarily reside in 2609. -But we do not know if this is where they have always derived...is this the 2609 of their original time line of their origin? -Because according to Peter and the Machine for many time lines do both the red and blue universe die due to a Peter choosing one side over the other...and it's hard to say if "when" is the same in all time lines, but it seems implausible that they would make it to 2609. So, then how do the Observers keep existing if both universes kept dying??? 1 and 2 are answered in my above explanation. "A short story about love" September was locked out of the time line...so what does that mean? -What in this case constitutes a time line? Where or when was he if he couldn't be "there" and if the other time lines (except for this other amber-red) are gone? This is inaccurate. The other Observers locked September out of this universe not timeline. The beacon allowed him to relocate this universe and be able to reappear back into it. I don't know how to help u understand me. It's about the chicken and the egg....The issue is that the Observers exist prior to the amber blue and red time lines. --They exist in season 1+. If the time lines keep getting destroyed @ 2026 mark (The Day We Died), then how do they still exist if the amber time line is truly after/created from the first three seasons (and iterations prior) They wouldn't unless they preserved it and it was once their origin time line and that is all that is left. This 2400-2609 has to exist somewhere all the time in order for the exact same Observers to exist continiously in every time line. Future is synonymous with history. (it's only called a future because of it's date. to our characters it is the future, but if the Observers live there it is their current. ) but if you think about Observers being created and there existence in the series, then you have to realize that that DATE OF ORIGIN pre-exists even prior to season 1. The timeline was in a loop, thus it was preserved. It never got destroyed completely since The machine parts were sent back through the central park wormhole. That was the endpoint of the loop, the beginning is the paleolithic period. The divergence that allowed the parallel universe to come into being happened after the paleolithic period since the machine existed in both universes. Does this make sense to you? Please say yes! Due to this there was still a possible future for the Observers to come from. Please understand this too. As you see in my last answer the machine did not fully get to ever destroy everything. Since the timeline was in a loop. Had the loop not been put in place then yes the Observers would cease to exist as well, but then none of this would matter. The timeline becomes corrupted for the invasion and the Observers so they had September erase Peter. To un-corrupt the timeline, and give birth to the Amber timeline. This 2400-2609 has to exist somewhere all the time in order for the exact same Observers to exist continuously in every time line. Again see my other answers for the explanation to your first paragraph. Our current timeline has Many, countless, perhaps infinite possible futures that ALL EXIST. THEY DO EXIST PHYSICALLY! Sorry I am not yelling, I am highlighting. From the perspective of ALL those possible futures our current timeline, and its past is their timeline's past. So the big bang September showed Peter was not just his big bang, it was our big bang too. This is why they are so concerned with any timeline the TV show is concerned with. Because any timeline that our characters are inhabiting, is the one that is their timeline. See There is only one timeline at a time per universe. The memories from Olivia and Walter, are not floating around in hyperspace. They are memories that came along with the re-appearance of Peter. There is no scientific explanation as September said when the beacon allowed him to re appear here. Love gave her her previous timeline's memories. I used the tape analogy earlier, so maybe like a video tape, the previously over-written memories, and Peter were bleeding through the over-write. It's funny because you are trying to convince me, and thinking I don't get it, while I am trying to convince you thinking you don't get it. Esoteric cosmology almost always deals with at least some of the following themes: emanation, involution, spiritual evolution, epigenesis, planes of existence or higher worlds (and their emanation and the connections between them), hierarchies of spiritual beings, cosmic cycles (e.g., cosmic year, Yuga), yogic or spiritual disciplines and techniques of self-transformation, and references to mystical and altered states of consciousness. In esoteric cosmology, a plane, other than the physical plane is conceived as a subtle state of consciousness that transcends the known physical universe. The concept may be found in religious, and esoteric teachings—e.g. Vedanta (Advaita Vedanta), Ayyavazhi, shamanism, Hermeticism, Neoplatonism, Gnosticism, Kashmir Shaivism, Sant Mat/Surat Shabd Yoga, Sufism, Druze, Kabbalah, Theosophy, Anthroposophy, Rosicrucianism (Esoteric Christian), Eckankar, Ascended Master Teachings, etc.—which propound the idea of a whole series of subtle planes or worlds or dimensions which, from a center, interpenetrate themselves and the physical planet in which we live, the solar systems, and all the physical structures of the universe. This interpenetration of planes culminates in the universe itself as a physical structured, dynamic and evolutive expression emanated through a series of steadily denser stages, becoming progressively more material and embodied. WALTER: Maybe I can. Belly's notes are incomplete, but I think I was right about the trigger. I think there is an instrument that can draw Belly's consciousness out of its new vessel. NINA: (watches as he walks to the ship's bell displayed on a cabinet top) Walter, what are you doing? WALTER: And I think... Belly would have left it with someone he trusted. NINA: (carries the bell back to her) No. You can't be serious. BROYLES: So these soul magnets drew your consciousness into Olivia after you died? WILLIAM BELL: Well, after my physical body died. As you can see, I am quite alive. Perhaps this is why the Observers don't physically die, or change when universes are physically dismantled or destroyed (<---this has been my delema in terms of "how" they keep existing the way they do), because they are tapped into the ethereal plane (etherael plane = all possibilities (many world theory) of all realities that have ever existed, which are eternally preserved, and have become the true keepers of time. It must be that the amber time line exists (or the times in it) because it was the space they were created. Making parts of it a very old time line...and that is the only reason why in this time line a physical change on their part could be remedied, because like I was trying to say, they kept Peter in particular out of it and just sent them back and let those universe die. It's September who gives our Peter a way to change...(Their time creates the rest, one after another, which don't ever make it to recreate the Observers, but there time line keeps moving and in retrospect because this requires using same bits of original history in every time line after the first magor alteration (machine taken back), creates time lines that would look like "the golden ratio". In other words they are super-Desmonds!